For other uses, see Cinnamon (disambiguation). Cinnamon (/ˈsɪnəmən/ SIN-ə-mən) is a spice obtained from the inner bark of several tree species from the genus Cinnamomum. Cinnamon is used mainly as an aromatic condiment and flavouring additive in a wide variety of cuisines, sweet and savoury dishes, breakfast cereals, snackfoods, tea and traditional foods. The aroma and flavour of cinnamon derive from its essential oil and principal component, cinnamaldehyde, as well as numerous other constituents, including eugenol. The term "cinnamon" also is used to describe its mid-brown colour. Cinnamon is the name for several species of trees and the commercial spice products that some of them produce. All are members of the genus Cinnamomum in the family Lauraceae. Only a few Cinnamomum species are grown commercially for spice. Cinnamomum verum is sometimes considered to be "true cinnamon", but most cinnamon in international commerce is derived from related species, also referred to as "cassia". In 2016, Indonesia and China produced 75% of the world's supply of cinnamon. The English word "cinnamon", attested in English since the fifteenth century, derives from the Greek κιννάμωμον kinnámōmon (later kínnamon), via Latin and medieval French intermediate forms. The Greek was borrowed from a Phoenician word, which was similar to the related Hebrew קינמון (qinamon). The name "cassia", first recorded in late Old English from Latin, and ultimately derives from Hebrew q'tsīʿāh, a form of the verb qātsaʿ, "to strip off bark". Early Modern English also used the names canel and canella, similar to the current names of cinnamon in several other European languages, which are derived from the Latin word cannella, a diminutive of canna, "tube", from the way the bark curls up as it dries. Cinnamon has been known from remote antiquity. It was imported to Egypt as early as 2000 BC, but those who reported that it had come from China had confused it with cinnamon cassia, a related species. Cinnamon was so highly prized among ancient nations that it was regarded as a gift fit for monarchs and even for a deity; a fine inscription records the gift of cinnamon and cassia to the temple of Apollo at Miletus. Its source was kept mysterious in the Merranean world for centuries by those in the spice trade to protect their monopoly as suppliers. Cinnamomum verum, which translates as 'true cinnamon', is native to India, Sri Lanka, Bangladesh, and Myanmar. Cinnamomum cassia (cassia) is native to China. Related species, all harvested and sold in the modern era as cinnamon, are native to Vietnam, Indonesia and other southeast Asian countries with warm climates. The first Greek reference to kasia is found in a poem by Sappho in the seventh century BC. According to Herodotus, both cinnamon and cassia grew in Arabia, together with incense, myrrh, and labdanum, and were guarded by winged serpents. In Ancient Egypt, cinnamon was used to embalm mummies. From Hellenistic times onward, Ancient Egyptian recipes for kyphi, an aromatic used for burning, included cinnamon and cassia. The gifts of Hellenistic rulers to temples sometimes included cassia and cinnamon. Cinnamon was brought around the Arabian peninsula on "rafts without rudders or sails or oars", taking advantage of the winter trade winds. Pliny the Elder also mentions cassia as a flavouring agent for wine. According to Pliny the Elder, a Roman pound (327 grams (11.5 oz)) of cassia, cinnamon, or serichatum cost up to 1500 denarii, the wage of fifty months' labour. Diocletian's Edict on Maximum Prices from 301 AD gives a price of 125 denarii for a pound of cassia, while an agricultural labourer earned 25 denarii per day. Cinnamon was too expensive to be commonly used on funeral pyres in Rome, but the Emperor Nero is said to have burned a year's worth of the city's supply at the funeral for his wife Poppaea Sabina in AD 65. Through the Middle Ages, the source of cinnamon remained a mystery to the Western world. From reading Latin writers who quoted Herodotus, Europeans had learned that cinnamon came up the Red Sea to the trading ports of Egypt, but where it came from was less than clear. When the Sieur de Joinville accompanied his king to Egypt on crusade in 1248, he reported – and believed – what he had been told: that cinnamon was fished up in nets at the source of the Nile out at the edge of the world (i.e., Ethiopia). Marco Polo avoided precision on the topic. Herodotus and other authors named Arabia as the source of cinnamon: they recounted that giant "cinnamon birds" collected the cinnamon sticks from an unknown land where the cinnamon trees grew and used them to construct their nests, and that the Arabs employed a trick to obtain the sticks. Pliny the Elder wrote in the first century that traders had made this up to charge more, but the story remained current in Byzantium as late as 1310. The first mention that the spice grew in Sri Lanka was in Zakariya al-Qazwini's Athar al-bilad wa-akhbar al-‘ibad ("Monument of Places and History of God's Bondsmen") about 1270. This was followed shortly thereafter by John of Montecorvino in a letter of about 1292. Indonesian rafts transported cinnamon directly from the Moluccas to East Africa (see also Rhapta), where local traders then carried it north to Alexandria in Egypt. Venetian traders from Italy held a monopoly on the spice trade in Europe, distributing cinnamon from Alexandria. The disruption of this trade by the rise of other Merranean powers, such as the Mamluk sultans and the Ottoman Empire, was one of many factors that led Europeans to search more widely for other routes to Asia. During the 1500s, Ferdinand Magellan was searching for spices on behalf of Spain, and in the Philippines found Cinnamomum mindanaense, which was closely related to C. zeylanicum, the cinnamon found in Sri Lanka. This cinnamon eventually competed with Sri Lankan cinnamon, which was controlled by the Portuguese. In 1638, Dutch traders established a trading post in Sri Lanka, took control of the manufactories by 1640, and expelled the remaining Portuguese by 1658. "The shores of the island are full of it," a Dutch captain reported, "and it is the best in all the Orient. When one is downwind of the island, one can still smell cinnamon eight leagues out to sea. ":15 The Dutch East India Company continued to overhaul the methods of harvesting in the wild and eventually began to cultivate its own trees. In 1767, Lord Brown of the British East India Company established Anjarakkandy Cinnamon Estate near Anjarakkandy in the Cannanore district of Kerala; it became Asia's largest cinnamon estate. The British took control of Ceylon from the Dutch in 1796. Cinnamon is an evergreen tree characterized by oval-shaped leaves, thick bark, and a berry fruit. When harvesting the spice, the bark and leaves are the primary parts of the plant used. Cinnamon is cultivated by growing the tree for two years, then coppicing it, i.e., cutting the stems at ground level. The following year, about a dozen new shoots form from the roots, replacing those that were cut. A number of pests such as Colletotrichum gloeosporioides, Diplodia spp., and Phytophthora cinnamomi (stripe canker) can affect the growing plants. The stems must be processed immediately after harvesting while the inner bark is still wet. The cut stems are processed by scraping off the outer bark, then beating the branch evenly with a hammer to loosen the inner bark, which is then pried off in long rolls. Only 0.5 mm (0.02 in) of the inner bark is used;[a] the outer, woody portion is discarded, leaving metre-long cinnamon strips that curl into rolls ("quills") on drying. The processed bark dries completely in four to six hours, provided it is in a well-ventilated and relatively warm environment. Once dry, the bark is cut into 5 to 10 cm (2 to 4 in) lengths for sale. A less than ideal drying environment encourages the proliferation of pests in the bark, which may then require treatment by fumigation with sulphur dioxide. In 2011 the European Union approved the use of sulphur dioxide at a concentration of up to 150 mg/kg for the treatment of C. verum bark harvested in Sri Lanka. Cassia induce a strong, spicy flavour and is often used in baking, especially associated with cinnamon rolls, as it handles baking conditions well. Among cassia, Chinese cinnamon is generally medium to light reddish brown in colour, hard and woody in texture, and thicker (2–3 mm (0.079–0.118 in) thick), as all of the layers of bark are used. Ceylon cinnamon, using only the thin inner bark, has a lighter brown colour, a finer, less dense and more crumbly texture. It is considered to be subtle and more aromatic in flavour than cassia and it loses much of its flavour during cooking. The barks of the species are easily distinguished when whole, both in macroscopic and microscopic characteristics. Ceylon cinnamon sticks (quills) have many thin layers and can easily be made into powder using a coffee or spice grinder, whereas cassia sticks are much harder. Indonesian cinnamon is often sold in neat quills made up of one thick layer, capable of damaging a spice or coffee grinder. Saigon cinnamon (C. loureiroi) and Chinese cinnamon (C. cassia) are always sold as broken pieces of thick bark, as the bark is not supple enough to be rolled into quills. The powdered bark is harder to distinguish, but if it is treated with tincture of iodine (a test for starch), little effect is visible with pure Ceylon cinnamon, but when Chinese cinnamon is present, a deep-blue tint is produced. These groups are further divided into specific grades. For example, Mexican is divided into M00000 special, M000000, and M0000, depending on quill diameter and number of quills per kilogram. Any pieces of bark less than 106 mm (4.2 in) long are categorized as quillings. Featherings are the inner bark of twigs and twisted shoots. Chips are trimmings of quills, outer and inner bark that cannot be separated, or the bark of small twigs. Combined, Indonesia and China produced 75% of the world's cinnamon in 2016 when global production was 223,574 tonnes (table). Four countries accounted for 99% of the world total: Indonesia, China, Vietnam, and Sri Lanka. Ground cinnamon is composed of around 11% water, 81% carbohydrates (including 53% dietary fiber), 4% protein, and 1% fat (table). In a 100 gram reference amount, ground cinnamon is a rich source of calcium (100% of the Daily Value, DV), iron (64% DV), and vitamin K (30% DV). The flavour of cinnamon is due to an aromatic essential oil that makes up 0.5 to 1% of its composition. This essential oil can be prepared by roughly pounding the bark, macerating it in sea water, and then quickly distilling the whole. It is of a golden-yellow colour, with the characteristic odour of cinnamon and a very hot aromatic taste. The pungent taste and scent come from cinnamaldehyde (about 90% of the essential oil from the bark) and, by reaction with oxygen as it ages, it darkens in colour and forms resinous compounds. Cinnamon is used as a flavouring in some alcoholic beverages, such as cinnamon-flavoured whiskey in the United States, and rakomelo, a cinnamon brandy popular in parts of Greece. A 2003 clinical trial reported on people with type 2 diabetes given capsules containing powdered cinnamon (C cassia) at amounts of 0, 1, 3 or 6 g/day for 40 days. All amounts significantly lowered fasting plasma glucose, which at the start of the trial, averaged 216 mg/dL. Subsequently, some 20 clinical trials were reported as reviews and meta-analyses, with inconclusive effects on fasting plasma glucose and hemoglobin A1C (HbA1c, an indicator of chronically elevated plasma glucose). Three reviews reported a modest decrease in fasting plasma glucose, two reported lower HbA1c, and two reported no change. The Cochrane review noted that trial durations ranged from 4 to 16 weeks, and no trials reported on changes to quality of life, morbidity or mortality rate. The authors' conclusion was: "There is insufficient evidence to support the use of cinnamon for type 1 or type 2 diabetes mellitus." Citing the Cochrane review, the U.S. National Center for Complementary and Integrative Health stated: "Studies done in people don’t support using cinnamon for any health condition." One 2003 study reported that dietary cinnamon lowered total cholesterol, LDL-cholesterol and triglycerides. A meta-analysis of 13 cinnamon supplementation trials with lipid measurements reported lower total cholesterol and triglycerides, but no significant changes in LDL-cholesterol or HDL-cholesterol. Cinnamon has a long history of use in traditional medicine as a digestive system aide. A systematic review of adverse events resulted from cinnamon use reported gastrointestinal disorders and allergic reactions as the most frequent reported side effects. Due to the variable amount of coumarin in C. cassia, usually well over 1.0 mg of coumarin per g of cinnamon and sometimes up to 12 times that, C. cassia has a low safe intake level upper limit to adhere to the above TDI. In contrast, C. vernum has only trace amounts of coumarin. Canella, a plant known as "wild cinnamon" or "white cinnamon"
Cinnamomea, a New Latin adjective meaning "cinnamon-coloured"
^ Cassia is thicker than Sri Lankan cinnamon. ^ "Cinnamon" . Encyclopædia Britannica. 6 (11th ed.). 1911. p. 376. ^ Iqbal, Mohammed (1993). "International trade in non-wood forest products: An overview". FO: Misc/93/11 – Working Paper. Food and Agriculture Organization of the United Nations. Retrieved 12 November 2012. ^ "cinnamon". Oxford English Dictionary (2nd ed.). Oxford University Press. 1989. ; also Harper, Douglas. "cinnamon". Online Etymology Dictionary. .
^ "cassia". Oxford English Dictionary (2nd ed.). Oxford University Press. 1989. ; also Harper, Douglas. "cassia". Online Etymology Dictionary. .
^ "canella; canel". Oxford English Dictionary (2nd ed.). Oxford University Press. 1989. .
^ "Cinnamon". Encyclopaedia Britannica. 2008. ISBN 978-1-59339-292-5. 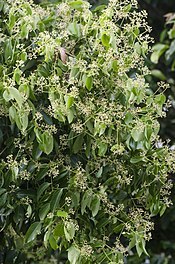 (species Cinnamomum zeylanicum), bushy evergreen tree of the laurel family (Lauraceae) native to Malabar Coast of India, Sri Lanka (Ceylon) Bangladesh and Myanmar (Burma). ^ Wheeler, James Talboys (1852). An Analysis and Summary of Herodotus: With a Synchronistical Table of Principal Events; Tables of Weights, Measures, Money, and Distances; an Outline of the History and Geography; and the Dates Completed from Gaisford, Baehr, Etc. H. G. Bohn. Retrieved 9 January 2019. ^ a b Burlando, B.; Verotta, L.; Cornara, L.; Bottini-Massa, E. (2010). Herbal principles in cosmetics: properties and mechanisms of action. Boca Raton: CRC Press. p. 121. ISBN 978-1-4398-1214-3. ^ Pliny the Elder; Bostock, J.; Riley, H.T. (1855). "42, Cinnamomum. Xylocinnamum". Natural History of Pliny, book XII, The Natural History of Trees. 3. London: Henry G. Bohn. pp. 137–140. ^ Pliny the Elder (1938). Natural History. Harvard University Press. p. 14. ISBN 978-0-674-99433-1. ^ Toussaint-Samat 2009, p. 437f. ^ Toussaint-Samat 2009, p. 438 discusses cinnamon's hidden origins and Joinville's report. ^ Tennent, Sir James Emerson. Account of the Island of Ceylon. 1. Longman, Green, Longman, and Roberts. Retrieved 8 November 2014. ^ Yule, Henry. "Cathay and the Way Thither". Retrieved 15 July 2008. ^ "The life of spice; cloves, nutmeg, pepper, cinnamon |". UNESCO Courier. Findarticles.com. 1984. Archived from the original on 9 July 2012. Retrieved 18 August 2010. ^ Independent Online. "News – Discovery: Sailing the Cinnamon Route (Page 1 of 2)". Iol.co.za. Archived from the original on 8 April 2005. Retrieved 18 August 2010. ^ Gray, E. W.; Miller, J. I. (1970). "The Spice Trade of the Roman Empire 29 B.C. – A.D. 641". The Journal of Roman Studies. 60: 222–224. doi:10.2307/299440. JSTOR 299440. ^ Mallari, Francisco (December 1974). "The Mindanao Cinnamon". Philippine Quarterly of Culture and Society. 2 (4): 190–194. JSTOR 29791158. ^ Braudel, Fernand (1984). The Perspective of the World. 3. University of California Press. p. 699. ISBN 978-0-520-08116-1. ^ "Cinnamon". Plant Village, Pennsylvania State University. 2017. Retrieved 28 February 2017. ^ Heath, Henry B. (1981). Source Book of Flavors: (AVI Sourcebook and Handbook Series). Springer Science & Business Media. p. 233. ISBN 9780870553707. Retrieved 9 January 2019. ^ Chen P, Sun J, Ford P (2014). "Differentiation of the four major species of cinnamons (C. burmannii, C. verum, C. cassia, and C. loureiroi) using a flow injection mass spectrometric (FIMS) fingerprinting method". J. Agric. Food Chem. 62 (12): 2516–2521. doi:10.1021/jf405580c. PMC 3983393. PMID 24628250. ^ "A Modern Herbal – Cassia (Cinnamon)". www.botanical.com. Retrieved 17 April 2017. ^ Pereira, Jonathan (1854). The Elements of materia medica and therapeutics. 2. p. 390. ^ "Grades of Cinnamon". Ceylon Cinnamon. 2016. Retrieved 14 January 2019. ^ a b "Global cinnamon production in 2016; Crops/Regions/World Regions/Production Quantity (pick lists)". UN Food and Agriculture Organization, Corporate Statistical Database (FAOSTAT). 2017. Retrieved 12 March 2018. ^ Czarra, Fred (1 May 2009). Spices: A Global History. Reaktion Books. ISBN 9781861896827. ^ "Cinnamon, spice, ground, per 100 g". US National Nutrient Database, Release 28, United States Department of Agriculture. May 2016. Retrieved 18 September 2017. ^ Yokomi, Naoka; Ito, Michiho (1 July 2009). "Influence of composition upon the variety of tastes in Cinnamomi cortex". Journal of Natural Medicines. 63 (3): 261–266. doi:10.1007/s11418-009-0326-8. ISSN 1861-0293. PMID 19291358. ^ Jayaprakasha, G. K.; Rao, L. J. (2011). 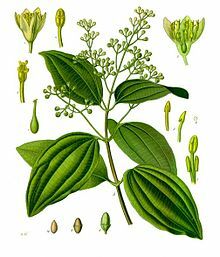 "Chemistry, biogenesis, and biological activities of Cinnamomum zeylanicum". Critical Reviews in Food Science and Nutrition. 51 (6): 547–62. doi:10.1080/10408391003699550. PMID 21929331. ^ "Oil of cinnamon". Toxicology Data Network (TOXNET). 6 August 2002. Retrieved 29 November 2016. ^ Haley Willard (16 Dec 2013). "11 Cinnamon-Flavored Liquors for the Holidays". The Daily Meal. Retrieved 17 April 2017. ^ a b Khan A, Safdar M, Ali Khan MM, Khattak KN, Anderson RA (2003). "Cinnamon improves glucose and lipids of people with type 2 diabetes". Diabetes Care. 26 (12): 3215–3218. PMID 14633804. ^ a b c Costello RB, Dwyer JT, Saldanha L, Bailey RL, Merkel J, Wambogo E (2016). "Do Cinnamon Supplements Have a Role in Glycemic Control in Type 2 Diabetes? A Narrative Review". J Acad Nutr Diet. 116 (11): 1794–1802. doi:10.1016/j.jand.2016.07.015. PMC 5085873. PMID 27618575. ^ a b c Allen RW, Schwartzman E, Baker WL, Coleman CI, Phung OJ (2013). "Cinnamon use in type 2 diabetes: an updated systematic review and meta-analysis". Ann Fam Med. 11 (5): 452–459. doi:10.1370/afm.1517. PMC 3767714. PMID 24019277. ^ a b c Akilen R, Tsiami A, Devendra D, Robinson N (2012). "Cinnamon in glycaemic control: Systematic review and meta analysis". Clin Nutr. 31 (5): 609–615. doi:10.1016/j.clnu.2012.04.003. PMID 22579946. ^ a b c Leach MJ, Kumar S (September 2012). "Cinnamon for diabetes mellitus". Cochrane Database Syst Rev (9): CD007170. doi:10.1002/14651858.CD007170.pub2. PMID 22972104. ^ a b "Cinnamon". National Center for Complementary and Integrative Health, U.S. National Institutes of Health. 2016. Retrieved 28 February 2017. ^ Maierean SM, Serban MC, Sahebkar A, Ursoniu S, Serban A, Penson P, Banach M (2017). "The effects of cinnamon supplementation on blood lipid concentrations: A systematic review and meta-analysis" (PDF). J Clin Lipidol. 11 (6): 1393–1406. doi:10.1016/j.jacl.2017.08.004. PMID 28887086. ^ Hajimonfarednejad M, Ostovar M, Raee MJ, Hashempur MH, Mayer JG, Heydari M (2019). "Cinnamon: A systematic review of adverse events". Clin Nutr. 38 (2): 594–602. doi:10.1016/j.clnu.2018.03.013. PMID 29661513. ^ Harris, Emily. "German Christmas Cookies Pose Health Danger". National Public Radio. Retrieved 1 May 2007. ^ "Coumarin in flavourings and other food ingredients with flavouring properties - Scientific Opinion of the Panel on Food Additives, Flavourings, Processing Aids and Materials in Contact with Food (AFC)". EFSA Journal. 6 (10): 793. 2008. doi:10.2903/j.efsa.2008.793. ^ Russell, Helen (20 December 2013). "Cinnamon sparks spicy debate between Danish bakers and food authorities". The Guardian. ISSN 0261-3077. Retrieved 26 November 2016. ^ Ballin, NZ; Sørensen, AT (2014). "Coumarin content in cinnamon containing food products on the Danish market" (PDF). Food Control. 38: 198–203. doi:10.1016/j.foodcont.2013.10.014. ^ Wang, Y-H; Avula, B; Nanayakkara, NP; Zhao, J; Khan, IA (2013). "Cassia cinnamon as a source of coumarin in cinnamon-flavored food and food supplements in the United States" (PDF). Journal of Agricultural and Food Chemistry. 61 (18): 4470–4476. doi:10.1021/jf4005862. Look up cinnamon in Wiktionary, the free dictionary. Wikimedia Commons has media related to Cinnamomum verum. "In pictures: Sri Lanka's spice of life". BBC News.